Born and bred in Brisbane, Peter loves the city and is passionate about treating his fellow Queenslanders. He has always enjoyed working with his hands in an artistic manner. Becoming a dental prosthetist was a perfect way to express that natural flare. He first became a dental technician in 1987 to gain a complete understanding of constructing all dental devices and their performance limitations. 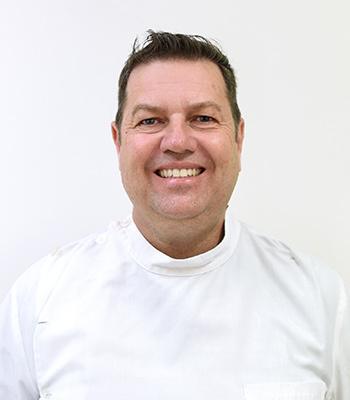 In addition to caring for patients at the practice, Peter also spends time working at the oral health unit at the Lady Cilento Children’s Hospital in Brisbane. There, he constructs dentures and surgical splints for patients born with cleft lip and palate abnormalities. In every aspect of dentistry, he has had the privilege of working alongside Australia’s leading dentists and specialists within Queensland’s foremost teaching hospitals and The University of Queensland. Peter’s interests comprise cosmetic dentistry, including 3D CAD/CAM, full and metal partial and flexible invisible dentures, mouthguards, and implant retained dentures. He takes a holistic approach to dentistry and is always conscious of the impact on his patients’ general health and wellbeing. When he’s not at the practice, Peter enjoys spending time with his wife Jodi and twin children Cooper and Imogen. They like BBQs, boating, camping and fishing. Peter also loves riding his motorbike on some twisty country roads early on a Sunday morning if he has time!